Aethlon Medical and its diagnostic subsidiary, Exosome Sciences, have announced the successful isolation of brain-specific biomarkers associated with a variety of neurodegenerative disorders. According to Aethlon Medical, the discoveries could have implications in the diagnosis, monitoring and treatment of Alzheimer’s disease, chronic traumatic encephalopathy and traumatic brain injury. Aethlon Medical develops therapeutic filtration devices for the treatment of infectious disease, cancer and other life-threatening conditions, while Exosome Sciences develops exosome-based solutions to diagnose and monitor acute and chronic conditions. Research studies provided evidence that exosomes can serve as a ‘liquid biopsy’ to diagnose neurologic conditions. Previously, exosomes from the central nervous system have been identified in the cerebrospinal fluid. The Aethlon- Exosome Sciences study identified exosomes carrying brain-specific markers tau, beta-amyloid, glycoprotein A2B5 and S100B protein in the peripheral circulation of affected individuals. These discoveries provide a basis for an exosome-based platform that could enable the simultaneous identification of multiple brain specific markers that are transported across the blood-brain barrier and into the circulatory system. Exosome Sciences chief scientific officer Dr Douglas Taylor noted this advancement represents a new paradigm for brain injuries. "In addition to providing definitive diagnosis, the proteomic and transcriptomic characterization of exosomes isolated specifically from the brain will provide a window into the molecular mechanisms underlying acute and chronic brain injuries," Dr Taylor added. Brain-derived exosomes can be specifically isolated and the protein and RNA cargoes identified as a result of the discoveries. In studies of brain tissue, specific RNAs have been associated with development of neurological disorders, contributing to the onset and progression of brain injuries. Exosomal RNA and protein cargoes represent surrogates to brain biopsies and have utility as stable, clinically accessible biomarkers for brain injury detection, stratification of patients and therapeutic outcomes. Aethlon and Exosome Sciences have also announced the filing of a provisional patent entitled, ‘Brain Specific Exosome Based Diagnostics and Extracorporeal Therapies’. 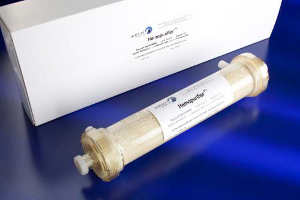 Image: Aethlon Medical’s Hemopurifier. Photo: Courtesy of BusinessWire/Aethlon Medical, Inc.